the erect position of the body with the face and gaze directed anteriorly (cranium aligned in orbitomeatal or Frankfort plane), the upper limbs at the side, and the palms of the hands directed anteriorly; terms of spatial relation such as posterior, anterior, lateral, and medial, are applied to the parts as they stand related to each other and to the axis of the body when in this position. a standard position of the body: standing erect, facing directly forward, feet pointed forward and slightly apart, and arms hanging down at the sides with palms facing forward. This position is used as a reference to describe sites or motions of various parts of the body. The position of an animal’s body at which the totality of its muscles are at their lowest tension. 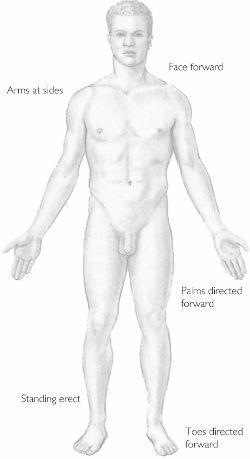 For humans, the anatomical position has a person standing erect, with feet facing forward, the arms at the sides, palms of the hands facing interior, and fingers pointing straight down. Anatomists and clinicians use the AP to build hypothetical biomechanical models of normalcy in which to describe movement of the centre of gravity. Standing erect, arms at the sides, with palms facing forward. n a reference posture of the human body, in which the anterior view of the human body is shown standing with legs slightly apart, feet forward, palms facing forward.